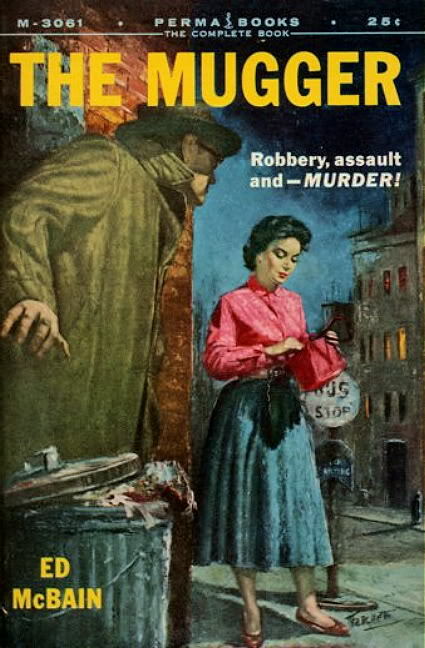 The Mugger does have one major flaw–the reader never learns what drives the mugger to indulge in his distinctive and entertaining but foolhardy and self-destructive trademark flourish (“Clifford thanks you, madam!”). This is likely attributable to McBain crankin’ ’em out (there were two other 87th Precinct books in 1956, plus an Evan Hunter novel and a science fiction novel as Hunt Collins), but it’s still not excusable and prevents the book, barely, from being fully satisfactory. It’s satisfactory enough, though–The Mugger whizzes by at a mere 150 pages or so, leaving the reader eager to spend more time in the 87th with McBain’s wonderful creations.